Description of "The Mystery Egg"
This is a story of two little girls who discover an abandoned egg. They take the egg home and decide to take care of it until it hatches. Little do they know what is in store for them. Ches D is a budding author. This is his first attempt writing a childrens book. He plans to bring in more titles in different categories. 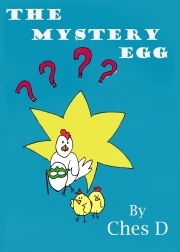 Reviews of "The Mystery Egg"